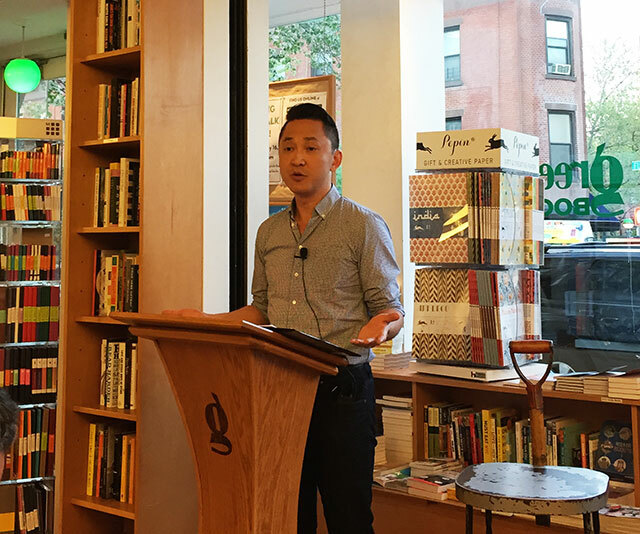 A self-described hipster, Viet Thanh Nguyen is a full-time Associate Professor at USC. He wrote his debut novel, The Sympathizer, during a two year sabbatical. 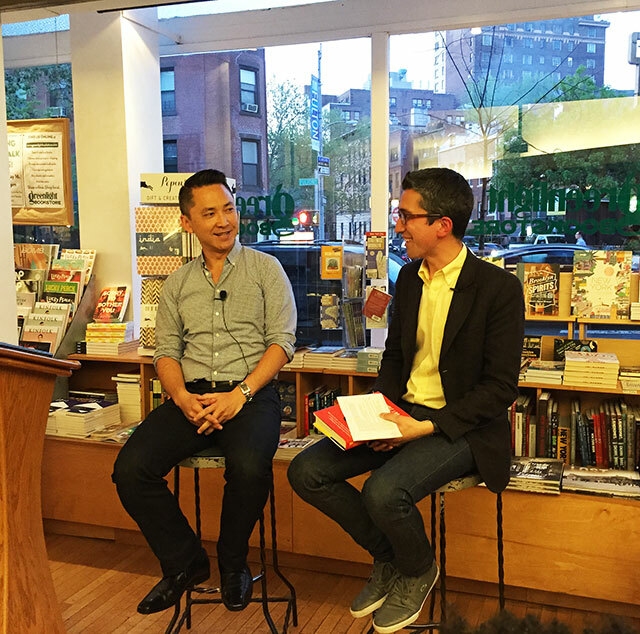 He read from the novel at Greenlight discussing the book with his editor Peter Blackstock. The protagonist and narrator of the novel serves as a consultant to a Hollywood blockbuster film. The movie is modeled on the big budget studio films about the Vietnam war like Apocalypse Now and Full Metal Jacket. “I grew up watching these types of movies,” Nguyen says. He always sympathized with the American soldiers in these types of films, but also found it strange when they would start shooting Vietnamese. The war is odd in that its one that the United States lost, but is also one that even as loser, continues to tell the story of. The result is that the portrayal of the war is crafted by the United States. Blackstock points to a review of the book that says Nguyen is “giving voice to the previously voiceless.” Its a label that Nguyen struggles with because the review is good, but the description bothers him. He says that whenever a new author writes a book, critics want them to be the spokesperson for whatever group they belong to. Audiences desire writers to speak for a group. Part of the problem is that American audiences are monolingual in the way they hear stories. The protagonist of the novel is half-Vietnamese, half-French priest. Nguyen says he wanted to include this duality of mixed race for two reasons. One, because people from both sides look down on the narrator. The reality of the situation is neither side is accepting. Second, Nguyen wanted a narrator who was capable of embodying both sides, to sympathize with both. Getting the cultural details correct was important to him. It is also critical to the character too, who as a film consultant criticizes the script for its inaccuracies. Nguyen read a scene where the film’s director and narrator end up fighting over the accuracy of the script. Still, there are things he took liberties with, like the era the book is set in. It takes place just a little earlier than is probably historically accurate, but with the details right, most audiences won’t notice. Nguyen struggled with the opening scene for months. He spent a lot of time working on the first sentence. Once he realized the narrative was going to be a confession, he says writing the narrative came much more easily. It also felt fitting because the Vietnamese would force prisoners to write confessions in their reeducation camps. Each night, prisoners would write out personal narratives, and then in the camps, they would workshop these narratives as part of the education. He says he felt there was an interesting parallel too with the rise of the writing workshop in the United States at the same time. Originally the book was meant to consist of twenty-five chapters of twenty-two to twenty-four pages. He liked the methodology and evenness of this design. He ended up with some tangents to help get each chapter to the right length. Then his editor took over. “I got over my OCD,” he says, praising Blackstock’s edits. He spent a lot of time working on short stories, and actually had been working on a story collection before his agent recommended he take up a novel instead. “My agent said I had to write a novel,” he says. He says one story that he has been working on since 1997 and that he has revised fifty times has finally been accepted for publication just last month.